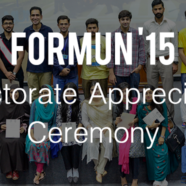 On 9 July 2015, the FORMUN ’15 directorate appreciation ceremony was held to give the certificates of appreciation to the directorate of FORMUN ’15. 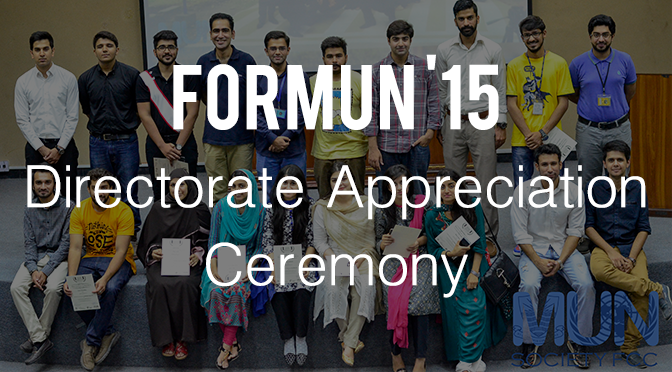 It started with an introductory speech by the vice president of MUN Society; Abdul Hannan. Amidst lots of laughter and comrade the certificates were given by the President of MUN Society while the vice president of the society announced the names. The ceremony ended with an appreciation speech by Areab Shuaib and culminated with a group photo of the previous council.